Loaded Cauliflower Bake is the perfect side dish – lower in carbs and so so good! It’s made with a little bit milk and grass-fed butter, garlic, and herbs and topped with bacon, cheese, and chives. So flavorful, creamy and so easy to make. I love mashed potatoes, but sometimes I prefer a side dish that is lower in carbs. 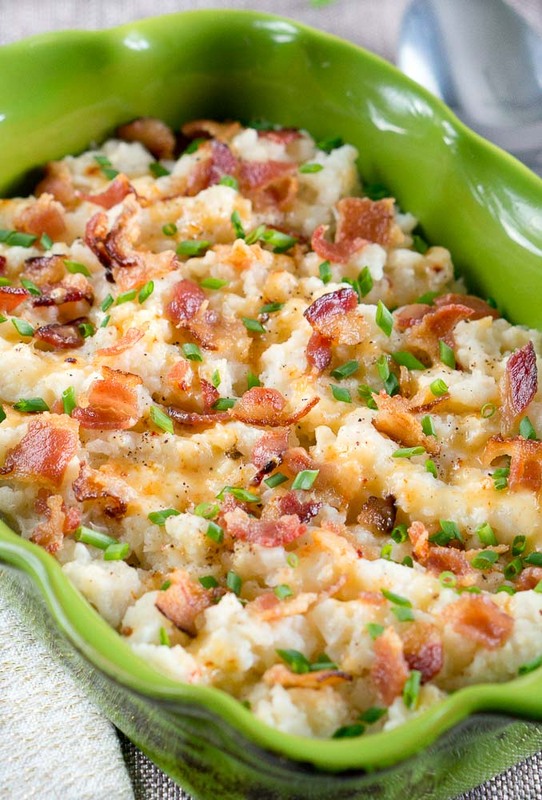 This loaded cauliflower bake is a great substitute for mashed potatoes. There are so many ways you can enjoy cauliflower – raw, in salads, sauteed, roasted, in a gratin and in a casserole dish. 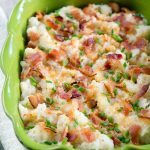 This loaded cauliflower bake looks fancy enough that you can serve to special guests, bring to a family gathering or Thanksgiving dinner. It’s rich and delicious! 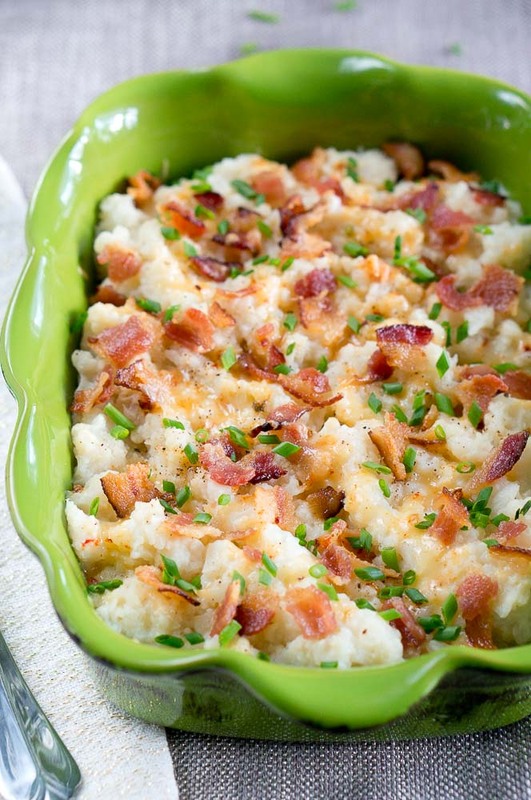 The addition of the garlic, bacon, and chives make this over the top cauliflower dish. Hope you enjoy it! What are your favorite ways to eat cauliflower? Boil cauliflower florets in water in a large pot, until the cauliflower is soft, about 15 – 20 minutes. Drain and return to the pot. While cauliflower is boiling, cook bacon slices in a skillet until crisp. Crumble and set aside. Puree cooked cauliflower with a potato masher or hand blender. Add minced garlic, milk, butter and season with salt and pepper. Mix in some chopped chives. 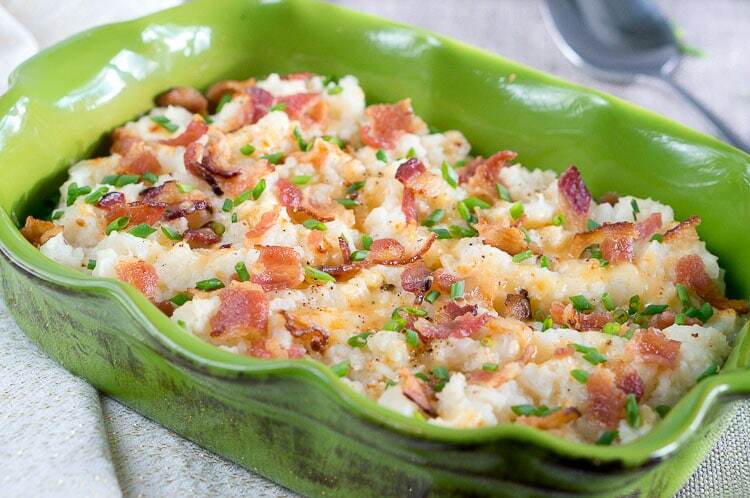 Transfer cauliflower mash to an 8 x 8 casserole dish, top with crumbled bacon and shredded cheese. Bake in the oven until cheese melts, about 5 minutes. Top with some more chives before serving. Loaded Cauliflower Bake is the perfect side dish - lower in carbs and so so good! It's made with a little bit milk and grass fed butter, garlic and herbs. Boil cauliflower florets in water in a large pot, until the cauliflower is soft, about 15 - 20 minutes. Drain and return to the pot. Cauliflower is so versatile, it can replace so many starches and be healthy at the same time.